Millennial Doctors May Be More Tech-Savvy, But Is That Better? : Shots - Health News Text messages from your doctor are just the start. Millennials are the next generation of doctors and they're not afraid to say "chillax" in a consultation or check Twitter to find medical research. Millennial Doctors May Be More Tech-Savvy, But Is That Better? 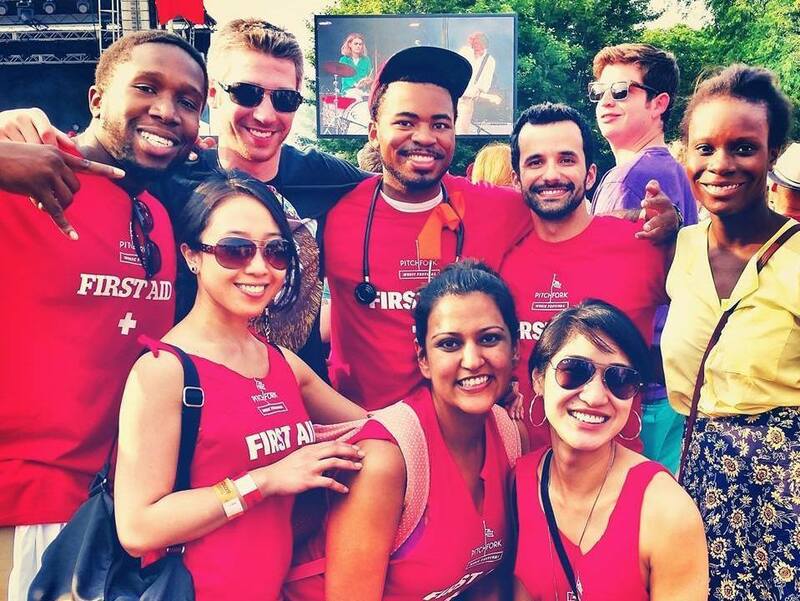 Medical residents including Dr. Amy Ho (bottom right) helped with first aid at the Pitchfork Music Festival in Chicago. The University of Texas Southwestern class of 2014 is celebrating graduation. Class vice president Amy Ho has shed her scrubs for heels and a black dress. She says with modern technology, med school really wasn't too hard. "If you want to do the whole thing by video stream, you can," she says. "I would wake up at 10 a.m., work out for an hour or so, get some lunch and then video stream for 6 hours and then go to happy hour. It actually was not that bad." Millennial physicians like Ho are taking over hospital wards and doctors' offices, and they're bringing new ideas about life-work balance and new technologies. One time, a patient asked Ho if it was OK if he recorded her performing a minor surgical procedure. "He Instagram-videoed the entire procedure," she says. "It's not that a senior physician couldn't do it — I think that they might not have the comfort level." She means comfort with technology. Millennial doctors want offices that are high-tech. Many have never worked with paper charts and they don't read dusty medical journals — they look at them online. "We absolutely consult Wikipedia, not the library to find the most up-to-date medical research," she explains. When young docs meet with patients, it's a safe bet they'll be behind a laptop or at least glancing at their smartphones. This is a big change from prior generations. "I think the physician patient relationship has suffered," says Dr. Rick Snyder, a cardiologist from the baby boom generation and past president of the Dallas County Medical Society. He worries that what's happening with young doctors is like what happened to young soldiers during Vietnam — yes, that's the analogy he used — when fighters became too reliant on technology and lost their dogfighting skills. "We as physicians, that's our dogfighting skills: talking to a patient, interacting with a patient," he says. "We really are required to spend more time with technology and our computers than we are with a patient." The old guard, Snyder says, well, they just worked more. "Your job came first. It was your family life; your personal life was second. You were supposed to sacrifice that. The newer generation, they're more willing to ask the question, 'Well, how much vacation time do I have? How much time do I have with my family?' Where, in my day, that could be a killer," he says. In the 1980s, residents spent so much time training at hospitals, Snyder says, that some med schools would talk about the divorce rate among med students as a badge of honor. Thirty-hour shifts were standard. Now, first-year residents aren't allowed to work more than 16-hour shifts. This reflects a larger trend of doctors working fewer hours and in teams. 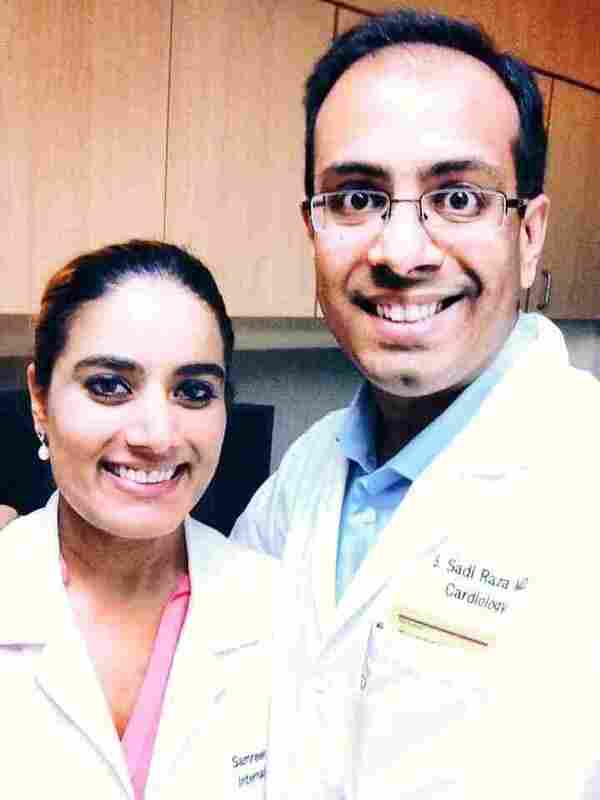 Dr. Sadi Raza has a lot in common with Dr. Snyder — they work in the same office, and both have wives who are also cardiologists. But Raza is a millennial. "My generation of physicians, when they come out of training, they are far less likely to go into solo practice," says Raza. Raza says virtually no one wants to be like the iconic doctor Marcus Welby — yeah, I had to look that up, too — working alone and making house calls. Millennial physicians are choosing hospital teams and group practices. "In some ways you go home with your work, but you're also working less hours and it's less stressful because your burden isn't on you exclusively, because of the team approach. There are people you can share management of a patient with," he says. The number of physicians employed by hospitals, rather than going solo, has doubled over the past decade, according to Dr. Robert Kocher, who wrote an article in the New England Journal of Medicine. Sharing patients, working less — the hope is that physicians won't burn out so fast. But some baby boomer doctors say practicing medicine with this kind of "sharing economy" approach could be bad for patients' health. Among them is Dr. Karen Sibert, an anesthesiologist in Los Angeles. "If you are having too many handoffs of care between one physician and another physician, and another physician, it's almost like the game you play when you were a kid — that you whisper a sentence in a circle, and see how screwed up it gets at the end of the game. It's like that, only way more dangerous," says Sibert. She bristles at the thought of working part time or less than 10 hour days. But working fewer hours doesn't mean millennials aren't out to change the world. After all, they are millennials. Take Amy Ho. Like many young doctors, she's combining patient care with policy work to reform the health care system. In addition to practicing emergency medicine, Ho is on the board of directors for the American Medical Association's Political Action Committee (AMPAC). And she has a message for patients worried about the next generation of doctors: "Regardless, there's one thing that I think holds true for every generation," she say. "Everyone is there to try and take care of you. Everyone is there because they want to take care of patients." Whether it's with a pen or a quill or a smartphone, she says, you'll still be in good hands.